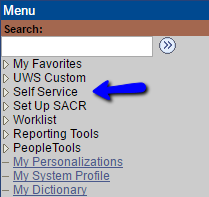 University of Wisconsin-Stout's courses are automatically set up as individual courses. Combining courses makes it easier for instructors to manage multiple sections of the same course, combine discussion sections and lab sections, and combine graduate and undergraduate sections into one Learn@UW-Stout course. Beginning with the spring 2017 semester, you will log in to Access Stout to select the course sections you want combined in Learn@UW-Stout. After logging into Access Stout, select Self Service. On the Self Service page, select My Schedule. On your teaching schedule you will now see new empty check boxes by all of the courses listed. Select the courses that you would like to combine, and then select the d2l - combine courses button. A message confirming the course combine request will appear, select OK. You will receive a confirmation email shortly. The check boxes by the requested combined courses will disappear, leaving you with the option to combine other desired courses. Continue this process until all desired courses have combine requests. If you have any specific comments about a combine request, reply back to the confirmation email you receive. Please do not add content to the individual section courses you want combined or have requested to be combined. We recommend that you wait until you have been informed by email that your "combined sections" course have been created. There is a chance you will lose all information imported during the combine process. When you receive an email from learn@uwstout.edu indicating that your combined course has been created, instructors and students will be enrolled into the new "combined sections" course and the original single section courses will be removed from your Learn@UW-Stout course listing that evening. Note: Beginning January 1, 2015, an exceptions process was created for instructors who make requests to combine Customized Instruction (CI) with non-CI courses/sections. Combining courses and/or course sections required approval at the dean and provost levels. Effective immediately, instructors requesting an exception should submit their exceptions request to their department chair. A recommendation will be made by the department chair to the college Dean. The college Deans will then send their exception recommendations and rationales to the Provost. The Provost's Office will continue to work directly with Learning Technology Services to process exceptions.